Robots with “vision” may soon work alongside humans, say researchers from Queensland, Australia. They have built a machine with hand-eye coordination, and the ability to process visual stimuli. It makes the machine dramatically different from all robots built previously, said Professor Peter Corke, director of the Australian Centre for Robotic Vision, as quoted by AAP. "We think this is critically important for robots to move out of factories and into all sorts of other domains. 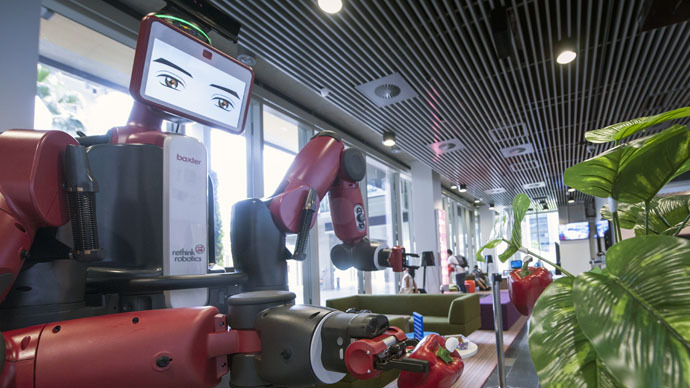 Baxter is perhaps the vanguard of this new wave of visually-enabled robots," he added. Currently, the machine called Baxter can distinguish basic colors and carry out simple tasks like picking a ripe fruit and vegetable, but “the real world is much more complex than that,” Corke noted, saying the technology is only in its infancy. Corke said that 'seeing' is far more than just processing images - it's a complex process tightly coupled to both memory and action, which gives robots the understanding they need to perform tasks that involve objects and places, while at the same time provide rapid and continuous feedback for control. "The human visual system is fantastic at just tuning all that extraneous information out and you realize it's the same building and you don't even have to think about it, but to program a computer to do that is really very, very difficult," he said, as quoted by Brisbane Times. The technology will be tested in the agricultural sector in June. There are a few more machines involved in the research: one of them was dubbed “Agbot II”, and it scans, fertilizes, and harvests crops. Others can create 3D maps of their environment, while the Guiabot can automatically move around a room and avoid obstacles in its path, and one miniature machine is capable of driving a toy car. The robots can work in teams, make decisions based on weather conditions, and scientists expect they’ll be able to communicate with manned devices. "The robots can also carry lots of sensors for soil monitoring, but also for pest and diseases, so they can be at the forefront of dealing with invasive species," Robotics Professor Tristan Perez said, as quoted by AAP. Professor Corke also commented on fears that robots may threaten humanity, saying the appearance of a robot with a personality or temperament is at least 10 years away. "We have the wicked smart robots that we see in science-fiction movies that perhaps look like us, they're humanoid in shape, very smart and very intelligent, but at the moment that is still the realm of fiction," Corke said, as cited by the Brisbane Times.